It’s difficult for a guy like me to write about “the street.” Having grown up upper-middle class in Westchester County, New York, I pretty much know “the street” only through the movies, and I could quickly make a fool out of myself here. But I’m gonna give it a try because it’s a social construct essential to Fruitvale Station, the compelling new docu-drama based on the fatal shooting of Oscar Grant by a San Francisco BART transit police officer in the first hours of 2009. The film shows us that there are two Oscars: one for his family and one for the street. It’s the second one that gets him killed, but it’s the unspoken question beneath the story that lingered in my mind for hours after: why are there two Oscars to begin with? 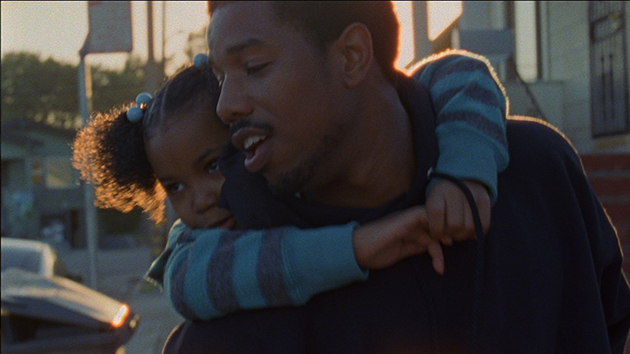 Fruitvale Station unfolds in two acts over the course of a single day – the fated night out and the day preceding it. Even before the fatal incident, it is a pivotal day for Oscar, and he spends most of it trying to rectify the mistakes of his past. His relationship with his girlfriend and the mother of his child, Sophina (Melonie Diaz), is strained due to his inability to stay faithful. He has lost his job at a high-end grocery and has resumed dealing drugs, although he’s toying with going straight again. Knowing what awaits Oscar on that midnight train could make these events unbearably bittersweet, but first-time director Ryan Coogler and actor Michael B. Jordan give them enough energy that we kinda forget what’s coming. It’s a simple slice-of-life of a poor, young black American, and we don’t see enough of of that at the movies these days. While Coogler has an exceptionally assured directorial hand for a first-time, 27-year-old director, it is Jordan’s sweet, soulful performance that drives the movie. He holds all of Oscar’s ambiguities in his eyes at once, yet he can also demonstrate the bigger changes that overcome him when threatened. Put simply, the screen is never boring when he’s on it. If the film has a flaw, it’s that Coogler occasionally lays on the foreshadowing a little too thick. As Oscar prepares to leave for the evening, the film seems to be shouting at us to pay attention to these last few moments in his life, including last conversations with his mother (an award-worthy Octavia Spencer) and an on-the-nose talk with his daughter (Ariana Neal) about guns. The story is most effective when it’s not being instructive. But by the time we get to the incident in question, the tension has been effectively ratcheted up, and these quibbles are forgotten. A fight breaks out on the train; a former adversary from prison attacks Oscar, and when the cops come, it’s Oscar and his friends who are pulled off the train and pushed around by a brutal cop, while the fight’s (white) instigator is allowed to go. Once off the train, Oscar changes to his “street” persona and begins talking back to the police and disobeying their instructions. This is his fatal mistake, and it is to the film’s deep and lasting credit that it seems to acknowledge how Oscar’s behavior – in his past and in the moments before his death – played some role in his own demise. It’s a rare movie that portrays race with this kind of balance. I’ve written several times now about the conservative approach to race in Obama-era movies. Whether it’s The Blind Side, 42, or the upcoming The Butler, Hollywood now seems to view racism as a problem that is solved by being apolitical, by staying silent and paying dues. Contrast that to Spike Lee’s glory days when he had Mookie throw a garbage can through the window in Do the Right Thing just to start the right conversation about the issue. Fruitvale Station finds a sweet spot between these two extremes by painting Oscar as both a victim of our national circumstance and his own personal worst enemy. He is a cog in a broken machine, trying to go straight but with no margin for error. Putting these ambiguities on screen is a massive, singular achievement that makes the film’s heartbreaking denouement feel even more tragic. Fruitvale Station is the best movie I’ve seen this year. really good review. i do agree that is instructional at times–i think that’s one of the few moments where coogler shows his first-time status as a director. but otherwise, the film is quite powerful. Yeah, but pretty darn impressive for a debut film by a 27-year-old director, right? For the most part, he knows his limits and didn’t try to do too much.